The Danbury News-Times and WTNH are reporting that the Candlewood Lake Authority and the five towns surrounding the lake are being sued for "willful, wanton and reckless disregard for safety" in regards to an accident last year. Attorney Agostinho Ribeiro of Danbury made those charges Wednesday after filing papers announcing his intent to sue the towns, all the members of the lake authority, and all members of the authority's Candlewood Lake Patrol, which works part-time in the summer to enforce boating laws on the lake -- 48 parties in all. At the same time, two other attorneys -- David Bennett of Danbury and Russell Palmer of Middletown -- filed similar papers, announcing their intent to sue the towns, the authority and the patrol. Bennett represents Kevin Sullivan of Bridgewater, who was seriously injured in the accident. Palmer represents William D'Addio, of Mahopac, N.Y., who owned a small bass boat involved in the accident. The accident occurred early in the morning of July 19, when three men -- Wanat, Sullivan and Richard Layton Jr. of New Milford -- left Down the Hatch Restaurant in Brookfield and roared off in Layton's 24-foot speedboat into the dark on Candlewood Lake. In the narrow channel between Vaughns Neck and Chimney Point, Layton's boat struck a small bass boat manned by D'Addio and Michael Iannucci, 35, of Cortlandt Manor, N.Y.
Layton and Wanat were killed, and Sullivan was badly injured. D'Addio and Iannucci were hospitalized briefly after the accident. "My client was in a medically induced coma for a month and was in the hospital for months,'' Bennett said of Sullivan, who finally returned to work with the Danbury Fire Department in December. "The Wanat family has been devastated by this accident," Ribeiro said. "They want to prevent others from being involved in similar accidents." By the sound of things, Danbury can kiss any increase in state aid good-bye...and Gov. Rell making someone faint during her speech was symbolic of the financial crisis lawmakers will have to deal with this year. Here's Gov. 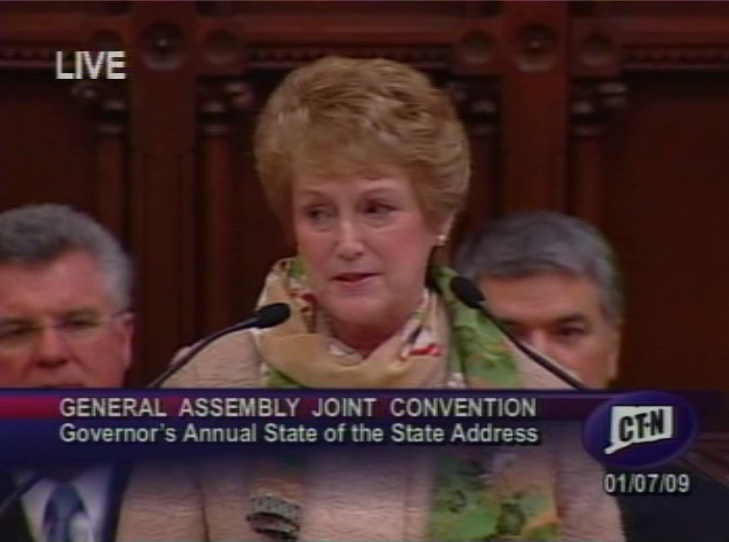 Rell's 2009 State of the State address. 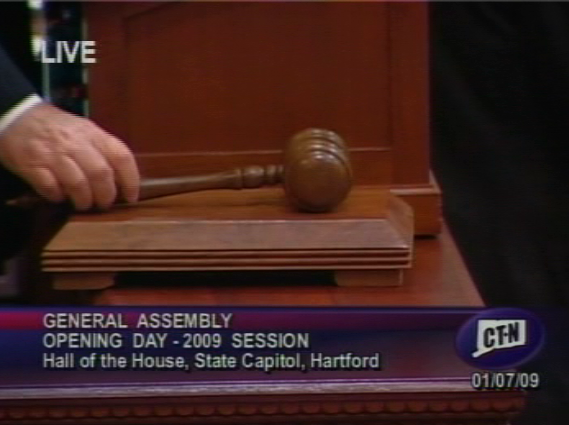 Mr. President, Mr. Speaker, Mr. Williams, members of the Legislature and guests: Welcome to the official opening of the 2009 regular session of the Connecticut General Assembly. The start of a new session, a new term in office, is always exciting. It's a time of new opportunities. New experiences. New challenges. It is a time for us to look forward, to await with eager anticipation the issues, the debates, the activities and actions that will unfold in the weeks and months ahead as we carry out the work of serving our fellow citizens. To those who return re-elected to office or are sworn in to a new office, welcome back. The building has been -- more or less -- quiet without you. To those who are new members, a very warm welcome. To the newly appointed committee chairs, ranking members, leaders: good luck. You are certainly going to need it. We all will. You will all need patience, understanding, wisdom, a strong but not unyielding will and the support of your colleagues. To our new Speaker of the House, my sincerest congratulations. I look forward to working with you with mutual respect, consideration and courtesy. Later, as the celebrations of this festive day conclude, our real work will begin as we govern at a time of great challenge. Just last week we bid goodbye to 2008. It was a year that few of us will ever forget, though we might like to, and one that historians, economists and others will be writing and speaking about for generations to come. It was a time of great highs -- the election of a new president, the first African-American president elected in our nation's history. A point of pride for all of us. But it was also a time of almost unimaginable lows. A national fiscal crisis, breathtaking in its scope. The collapse of Wall Street, record home foreclosures, record business failures, record job losses and record government bailouts. Yes, 2008 is behind us, but the problems it ushered in will not go quietly in this New Year. We will not soon see an end to bankruptcies and foreclosures, to pink slips or red ink. Families in Connecticut and across the nation are rightly fearful and angry. They want to know how and why this happened, and whose fault it is. They also want to know how they will ever be able to afford to retire or put their child through college, given the steep declines in their 401k's and savings accounts. How will they afford to pay their bills if they lose their job? Unfortunately, other than unbridled greed by far too many on Wall Street and almost criminally lax oversight by far too many in Washington, there are no easy answers. No easy answers, but lots of questions. Lots of concerns. These are the worst financial times any of us can remember. Let's face it, it's scary. But one concern people should not have is a state government they cannot afford -- which is what they have right now. And cities and towns will need our attention as they also struggle with the fiscal pressures of the economy. The national economic storm has engulfed Connecticut and its municipalities. It has washed up on shore a set of difficult challenges and it has brought clarity to our mission of educating our children, protecting our natural resources, providing for those in need, keeping our people safe and making our state a place of unmatched opportunity. Our mission may be a clear one. But the path we will take this session to fulfill it will not be, for the obstacles and challenges and needs we will face will be many. And our resources will be few -- too few. As families struggle to pay their monthly bills, so will we. As they cut back on expenses and forego new purchases, so must we. And we must do it at a time when, as is the paradox of government, more and more families will be looking to us for help. Our revenues are declining but the need for government services is increasing. As jobs continue to be lost or wages cut or frozen, our citizens will need our help for basic necessities: food and heating assistance, unemployment assistance, child care, health care. How we fulfill our responsibilities will overshadow all that we do this session. It will guide our every decision. It will color everything. Action will be taken this session, as it should be, on a host of different issues -- health care, criminal justice, transportation, education and the environment, to name but a few. The ideas, the proposals, the plans will be plentiful. The resources needed to bring many of them to life will not be. In recent good economic times, we made strategic and historic investments in our state. We took advantage of a strong economy to invest in education, in transportation, in healthy children and in the technologies that will lead us into the future. In these difficult economic times, we must now find strategic savings and reductions throughout government. Government must shrink because our taxpayers are seeing their personal budgets shrink. The recession has landed hard on the doorsteps of many of our citizens and they are looking to us for relief. They expect us to work together to bring new approaches to the table -- because that's what leaders do. And it is exactly what we have been doing over the last several months. Late last spring it became apparent that our state budget for last fiscal year was headed for red ink. I ordered a state hiring freeze, a state purchasing freeze, sought reductions in state gasoline usage, banned out of state travel and took other actions. We averted the red ink and instead ended the year with a modest surplus. In August, with the cost of gasoline and home heating oil rising past $4 a gallon, we knew we needed to do something to help, long before the first cold winds of autumn or winter blew. I called you into special session and together we produced a package of proposals aimed at providing energy and heating assistance for families in need, as well as for the elderly, schools and non-profits. And we paid outright for these proposals with the modest surplus we produced a month earlier. And while prices have come down, regrettably, more and more people still need our help. In October and November I took a number of other actions, as the news from Wall Street grew increasingly grim and as the silence of inaction in Washington grew increasingly deafening. I met with the leaders of our state's community banks and we put together a targeted, $100 million loan program to help ease the credit crunch for our state's employers. We also issued funds for brownfield remediation and reallocated Manufacturing Assistance Act funds, all in an effort to spur economic development. I also sought changes to our foreclosure laws to better protect homeowners and renters. Last month I worked with our state's credit unions and we announced a special, $25 million program to help students and their parents with low-interest college loans. We wanted to help those families who were struggling to pay tuition for this spring semester. I have also made three rounds of rescissions and offered two deficit mitigation plans. You passed one last month, and I thank you for your leadership. I do hope you will pass the second plan next Wednesday. Because of the actions I have already taken and you have already taken, Connecticut is in far better shape than many other states. Yes, in far better shape but still facing a new economic reality. But I firmly believe that this time of great challenge is also a time of great opportunity. This is how I see the State of our State: Built on a firm foundation, facing incredible challenges and yet poised, if we make the right decisions in the session ahead, to take advantage of incredible opportunities. I know how easy it is for us to be overwhelmed by the incessant drumbeat of bad economic news. It hangs about us like a tight-fitting cloak. I also know we must never lose sight of the fact that Connecticut remains a place of great promise and extraordinary people. Our quality of life is second to none. So too are our educational opportunities. Our work force is skilled and our people are industrious. Our hearts are generous to those in need and our natural resources are bounteous. No. 1 in per capita personal income No. 5 in exports No. 1 in Fortune 500 companies per million population No. 7 in patent applications per capita We are leading the bioscience revolution and we are home to cutting-edge technologies and life-changing medical advances. Stem cell research, aerospace, nanotechnology, fuel cells, pharmaceutical research -- all position Connecticut for the industries and jobs of the 21st century. I know times are tough, but I know that the people of Connecticut are tougher. I know that we are a people of resolve -- we will do whatever it takes to not only weather this storm but to plant the seeds of a bountiful recovery. This will be a time of shared sacrifice. That which we would like to do will be set aside for that which we must do. We must take care of our most vulnerable and we must meet the core mission of government of which I spoke earlier. The sacrifices will not be easy or painless. The recommended two-year budget I present to you next month will reflect that. The cuts that must be made will be deep and they will affect every agency, every program and every service provided by state government. They will hurt. They hurt me to even offer them. I have spent countless hours in the last few weeks poring over every line item in our budget. I have lost countless hours of sleep worrying about our families and their household budgets and worrying about our state budget and the cuts we need to make. But we do need to make cuts and we do need to prepare our state to make the most of the economic recovery when it comes -- and it will come. For our goal, our charge as leaders is not to merely help Connecticut survive these economic challenges but to help Connecticut thrive. We must make the right choices now so that we may close tightly the doorways of despair and open wide the windows of opportunity. One of the main reasons Connecticut is in far better shape than many of our neighboring states is because we have worked together over the last few years to position ourselves to deal with the uncertainties of a roller coaster economy. We built up our budget reserves, we strengthened and diversified our economy and we invested in our work force. And we did these things together. Now is the time for us to again act and to lead. The problems we are facing are not permanent. And they are not ours alone. Economies around the world are slowing down. But Connecticut is our place to protect. Together we will lead with a purpose to guide our state to better times. I feel blessed to be Governor of this great state, but I also feel the tremendous burdens of office during these anxious times. But my burdens are set aside, replaced by an urgent sense of protection, passion and purpose every time I look into the face of a neighbor or into the eyes of a child and see their hopes and dreams for the future. The same is true when I learn of a family who is visiting a food bank for the first time or when I talk to a proud, independent senior who is embarrassed to ask for help in filling their oil tank. And it's true when I see our brave troops off as they depart for selfless, dangerous service in Iraq or Afghanistan. You know, before I return to this Chamber to give my budget address next month nearly 100 soldiers will begin their deployment, bringing to more than 300 those from Connecticut serving overseas. Before the end of the year, we are scheduled to see another 1,000 of our sons and daughters deployed. Sons and daughters we want to forever protect in our loving embrace. Children and families and seniors we want to -- we need to -- see through these difficult times. As Governor, I promise to lead with integrity, energy and purpose. This financial crisis is indeed our call to action. Protect our families and their futures Restore the prosperity built through the inspiration and ingenuity of our founders Eliminate the impediments to our progress And our greatest challenge, to not let the nation's financial crisis dampen our enthusiasm and optimism about the future of this great State Connecticut is an incredible mosaic of people and places -- a tapestry of natural beauty, history, culture and character. Now is the time to work together to protect this special place along the long tidal river and to build the proud tomorrow of Connecticut's future. Thank you and God bless the State of Connecticut. It seems like you guys love hockey fights. In advance of tomorrow's game between the Brooklyn Aces and the Mad Hatters (which are becoming game/fight to attend), courtesy of the local access show "On the Run," here's footage of the greatest Hatter's fights from last year. 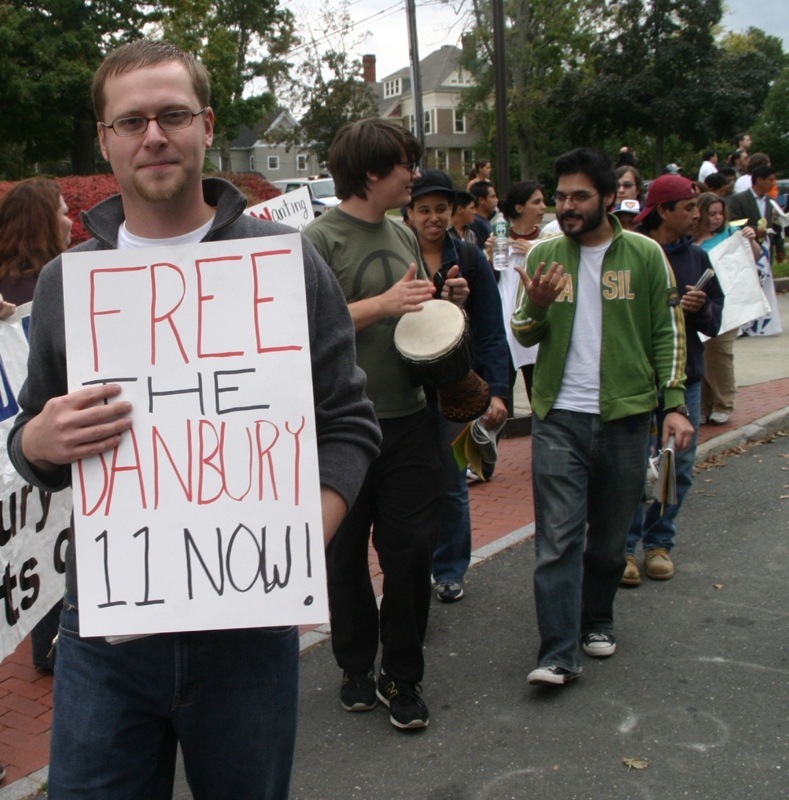 Be sure to watch the "love" that was shown to Mayor Boughton about 2:40 into the video...it reminds me of what happened at the 2007 Taste of Danbury. Today is the opening day of the state's 2009 legislative session and I'm live blogging on everything happening at the State Capitol (including posting video footage) over at My Left Nutmeg. My oh my, can you smell the B.S.? The city has saved more than $100,000 in energy costs since moving to a four-day work week last fall, officials said Monday. Finance director David St. Hilaire said the final figures aren't available, but conservative estimates show the city has saved about $54,000 to date on its electricity bills as a result of the condensed work week. An additional $24,000 added to the utility budget in anticipation of higher costs, which wasn't used, brings the total savings to about $78,000, he said. "There's no doubt that there is a definite savings," he said. "This frees up money that we can use in other areas where savings weren't available." Yeah...I'll place this right up there with the other famous whoppers we've heard from Boughton and Co (parade ordinance needed to address World Cup celebrations, the de-funding of the Hispanic Center was not racially motivated, 287g needed to fight crime, tax break to BRT was necessary, etc). Minority Leader Tom Saadi isn't drinking the kool-aid. "This is not just about dollars and cents but about the public's access," he said. "We will have to balance the savings with the feedback we receive from residents about how this has impacted them." For a city that spends money like there is no tomorrow, I find it incredibly hard to believe that the closing of the library (a.k.a. taking away one of the most important services to the taxpayers of Danbury) contributed to the type of savings we're hearing from City Hall. In fact, I'll bet the house that this has more to do with complaints from pissed off residents who are outraged that the library was closed on Fridays in the first place (and as someone who uses that facility on an almost daily basis, I know I'm one of them). One only needs to go down to the library AT ANY TIME DURING THE DAY to see how many people use that facility. Hell, right after I'm done with this post, I'm taking a trip down there to do some work. The closing was boneheaded from the start and made no sense seeing that the place is open on Saturday and Sunday...in other words, how does one save energy if you have to heat the place up the next day (unlike City Hall which is closed on Saturday and Sunday)? As for the 4-day work week nonsense in order to save cash, lets see how things worked out in Brookfield. The Board of Selectmen on Monday unanimously agreed to end the town's four-day work week. The town moved to a four-day schedule in October, hoping to realize savings of 20 percent on energy costs, according to First Selectman Robert Silvaggi, who said actual savings were nowhere near that level. At Monday's regular selectmen's meeting, the board received two letters opposed to the four-day week. "This is a disservice to the town and more importantly, there is no justification for doing this," said a letter from Board of Finance chairman Ernesto Nepomuceno. "For one thing, the timing is so wrong because it hampers the town's ability to address and resolve a number of issues, particularly at a time when the audit activities in progress." "I believe all this four-day week schedule does is to appease some town employees at the expense of the taxpayers," the letter went on. A letter from residents John and Christa Van Devender said a couple of Fridays ago Brookfield Town Hall "was as quiet as Pearl Harbor on a Sunday morning -- nobody around." "Interesting experiment, but it failed," their letter added. "Back to basics." Selectmen Joni Park and Jerry Murphy also voiced wishes to end the practice. "I would like to move that we go back to a regular five-day week and serve the citizens of this community in a way that I think they deserve," Park said. "It just didn't work," he said. "We're not providing the services to our people." Maybe Danbury can learn a thing or two from Brookfield and stop screwing the people out of services which WE PAID FOR! Today in D.C. Chris Murphy was sworn in to serve a second term as the 5th District Congressman (while James Galante's BFF David Cappiello's lawn signs continue to litter the area). Congressman Murphy released the following statement today. “Today, as I welcomed back my colleagues, and greeted new ones, I couldn’t help but notice the mixture of excitement and trepidation that filled the Capitol. “I believe we are living in a once-in-a-century political moment. All at once, our nation’s economy faces threats not seen since the Great Depression, our military is engaged in two wars, and new international crises are erupting almost daily while our nation awaits the arrival of a new President with a mandate for transformational change. “As soon as the pomp and circumstance of the swearing in has passed, we need to get right down to work. This country cannot wait any longer for an aggressive and comprehensive economic stimulus bill that creates jobs, and President-Elect Obama has made it clear he wants to sign a bill shortly after he takes office. I want to make sure the bill gets as much assistance to Connecticut as possible, where news of layoffs is now a daily occurrence. Wow...didn't see that one coming. The ONLY place in the area where you can play pool on a 9 foot table is gone. Hopefully, someone will contact Dave and Buster's and tell them to set up shop at that location. By popular demand, here's the latest version of the charter revision commission's draft. The proposed changes to the charter are underlined. DOWNLOAD: Click here to download a copy of the draft to your harddrive.